Britain's Queen Elizabeth II and with her husband Britain's Prince Philip, Duke of Edinburgh, Catherine, Duchess of Cambridge and Queen Maxima of the Netherlands and King Willem-Alexander of the Netherlands, Sophie, Countess of Wessex, Britain's Prince William, Duke of Cambridge, Britain's Prince Harry and Britain's Prince Andrew, Duke of York and Princess Michael of Kent, Birgitte, Duchess of Gloucester and Prince Richard, Duke of Gloucester attend the annual Remembrance Sunday Service at the Cenotaph on Whitehall on November 8, 2015 in London, United Kingdom. 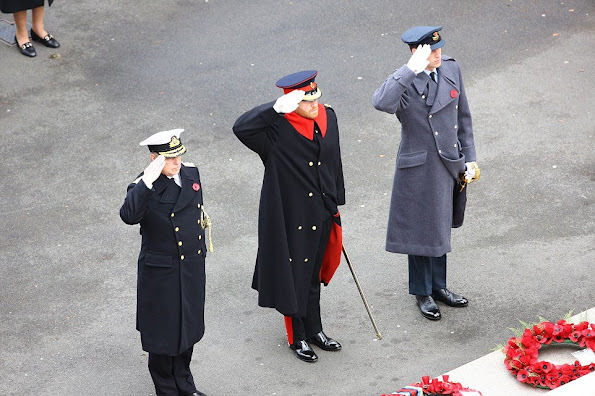 People across the UK gather to pay tribute to service personnel who have died in the two World Wars and subsequent conflicts. No need to shout show a little class. 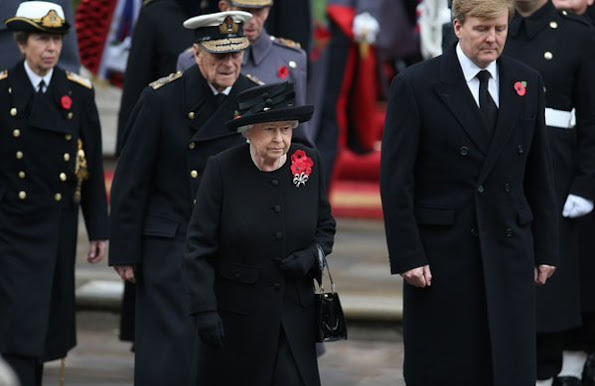 Hi the Queen of the Netherlands worn a coat at the Remembrance Sunday ceremony! How refreshing. What a disappointed to those who describe her as one with charisma. See the English weather demands a coat!! 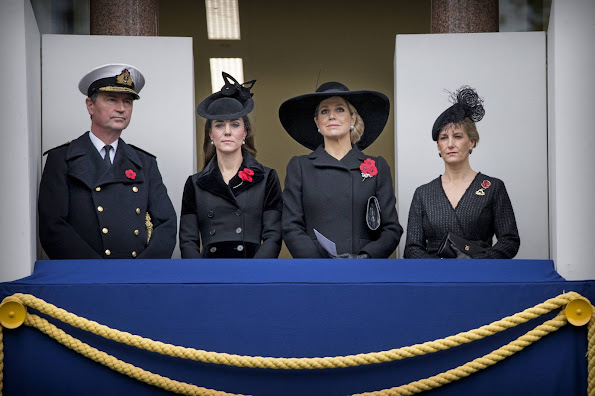 Both the Duchess Catherine and Queen Maxima looked great and appropriate dress for this ceremony. 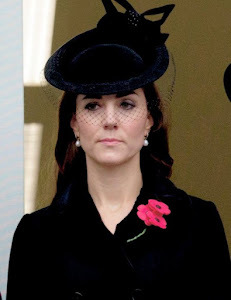 But once again does not matter what Duchess Catherine wear she will always be gorgeous. ...And yet again, the admin. decided not to post my comment. Dear admin. what are you so afraid of? Post it, let people weigh in their opinions or re-name your blog Mary of Tasmania! Why don't you just start your own blog where you can rant to your heart's content??? I guess you are correct. if this blog is to be know Mary of Tasmania I should have one of my own. A quick question how do you know I was ranting if you haven't seen by comment blocked by the admin. Are You the admin.? Just post it and let the people decide weather it is ranting or not? Fair enough? I agree with anon 20.11. Because you post the same thing over and over again, I was going to say like a parrot but the poor parrot does not deserve it. As this is about the Remembrance Service and you are making it about Mary show how scary your posts are. To your information 22:45 ano 16:49 are not alone, everytime I don't prize Miss Mary or compare her to others it gets deleted. And they are not even bad comments. They just tell the truth. And at the same time we see negative and sometimes vicious comments written about Letizia, Mette-Marit, Charlene, Sofia and Kate. Why is that allowed? And maybe 16:49 was comparing Mary to Kate(who gets al ot of flak, Mary don't) and the different way they get treated or maybe talking about a coat Mary has..who knows? I agree with so many others. Not happy? Go away and run your own blog. Or are you one of those haters whose blogs didn't last. I'm not trying to be rude, but you sound really psycho. Weird. Well at least Kate didn't seem to giggle or hair twirl this time. Probably because there was a Queen standing next to her. Maxima and Sophie look lovely. 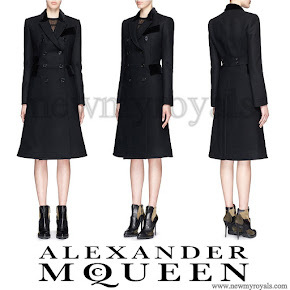 Yet another new coat for Kate. Guess we know what she's been doing for the last few months. Being a mom to a baby and toddler. I would say the most important job in the world. Maxima Mathilde Sophie Letizia Victoria Madeleine Mary Marie and many more royal ladies all have nannies,dear Catarina G not just Kate. But Kate is the only one who does not work! Agree. Kate looks always sad. Maybe post partum depretion? But she looks sweet and lovely. Maxima is warm and elegant as she only can be. You are vicious and your comments should not have been posted. Wow, Queen Maxima stole the show! She looks so elegant and classy. Love her hat and hairstyle. Easy to see who is confident, dedicated hardworking and regal. I agree with you. Beside being a smart woman, always decent and classy and (as far as I know ) after she became a royal she never took a false step, in my opinion Queen Maxima has something other royals don't have : charisma . Maxima wearing the big hat makes it all about her, and as she is standing next to Sophie it makes Sophie look washed out. I like Sophie. Catherine hasn't repeated a black coat since her first Rembrance day ceremony. How many black coats does one need? She's getting much better at the serious and sad facial expression. Maxima is the best at this! Yes Maxima is the best actress of the lot. 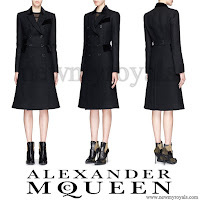 Actually she repeated 2011 and 2012 a DVF coat. 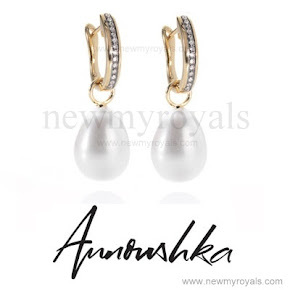 But the question is moot: she is a royal princess and she "needs" as many as she wants. Has Sophie repeated? Countess Sophie Wessex has over 300 work schedule (as is her husband Prince Edward -Earl Wessex),we can expect her wardrobe repeated and is value for pounds; compare to the least royal who knows nothing about work, service and duty (with staff, nannies caring for her children, even to place the baby in a carriage at her Christening). Why is using a baby carriage a sign of knowing nothing of service,work, or duty? Just curious. 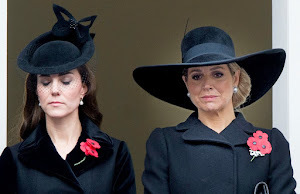 The Duchess and Countess look lovely as usual. Glad to see HRH The Duchess of Cambridge in attendance. Queen Maxima is an attractive woman, but I don't care for many of the large hats she wears. They seem overpowering. ....but much better than her mother-in-laws giant cake hats. Remember it is the media who choose which of the many images they use as the photographers have taken! And also the media have their own royal favorites, just like you and me! By this event has been taken hundreds and hundreds, few choosen! Remember it is the media who choose which of the many images they use as the photographers have taken! And also the media have their own royal favorites, just like you and me! By this event has been taken hundreds of pictures, few choosen! 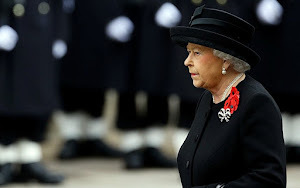 Queen Elizabeth is the only Queen here the other a pretender. duchess kate does NOTHING for 5 charities, yes five and never give speeches, really is this the future of the royal family in Uk, its a joke!! 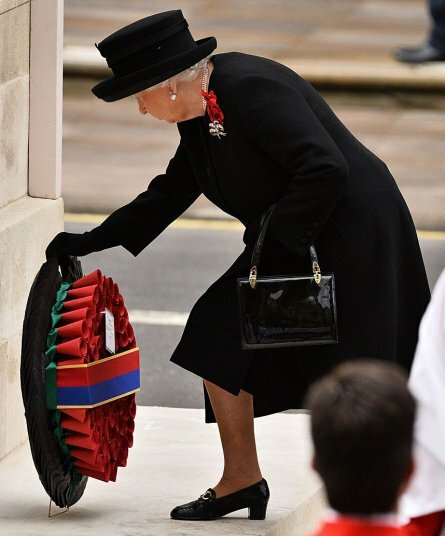 shes the biggest waste of taxpayers money to walk on two feet!! Well we are all entitled to our own opinions, but not our own facts. Her support of the charities she works for is well documented on YouTube and various blogs. We don't see all of the activities Royals engage in when supporting an organization. Not all are released to the media. Like her or not, she is a future Queen of the UK. Many of us understand she is the mother of young children, and does not undertake the same schedule as The Countess of Wessex whose children are older. As I recall, the Countess only stepped up her schedule once Louise and James became older. They both look washed out, I know the occasion is very solemn but still, they don't look chic at all, boring old coats and hats. This is not a fashion show,my friend! 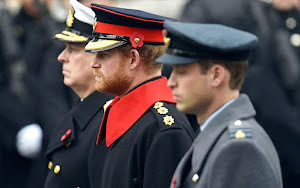 Agree, the donothing was really light, hoping to give that solemn look (just in case). Maxima is a Very beautiful woman in every circumstance. It's hard to believe that she and Kate has more than 10 years of age gape. As a matter of fact Queen Maxima looks older on this photos as she is. Maybe because she lost too much weight recently and it shows in her face. Queen Maxima looks stunning, although she was in hospital last week. A new broom sweeps clean but the older broom knows the corners. Well , I am not a big fan of Duchess Catherine but I like her . I don' t understand why all this "hate" for her , and why blaming her for not working too much . I think you should consider that she and her husband are NOT supposed to take the crown in a near future . PC and Camilla are the next ones to follow . IMO the dukes are not overexposed to public for this reason . Who is supposed to work harder is Prince Charles and wife , do u agree? In the case the Dukes will start being more and more present in public life and engagements for sure somebody will complain they want to steal the scene to the father . And this will be not fair for the royal family . Give them time . Their time will come and I am sure they will prove to anybody they can do the job ;) It is already clear . Finally I think the fact that Catherine is very involved in her maternal role at the moment it's quite good . In the future she will not have too much time to dedicate to her children . Maxime looks younger than kate who feels like an old boring lady! 1) I dont hate Kate!!!!! I just want to see her more-If she wants to be a stay at home mother she married the wrong man. 2)I don't think she is someone special because she has two children and married a Prince. 3)I don't like her fashion style,and this is only my opinion. 5)She could work one or two hours a week for a charity,her children have nannies. 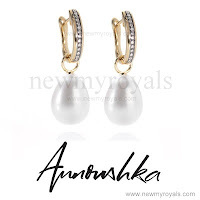 6)If the administrator of this site wants us to comment only fashion,he-she can inform us. 7)When someone is representing a country,we are fee to say our opinion about his or her style or work. 8)Have a nice evening or day,all!!!!! Agree 100%, this is the best comment by far. Maxima looks stunning, really beautiful. Happy that she is over her health issues. 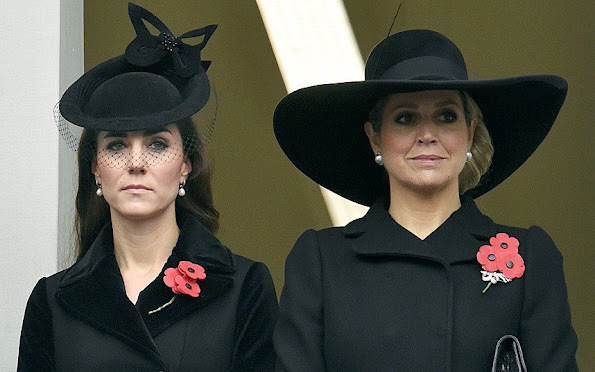 I hate to say it, but Kate looks older than Maxima. She doesn't look well or happy. 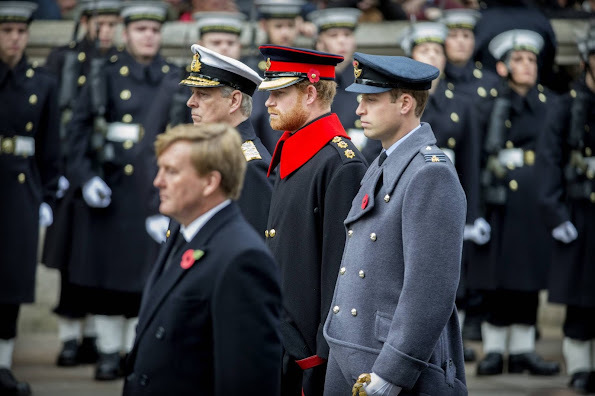 Prince Harry is getting better and better looking. I know this blog is generally about women, but he looks pretty good. You sound like my mother when she is talking about the wife of my brother and you are right Kate looks old, ill, cheap, just boring hopefully she gets a better looking one time, but i don´t believe. I can understand if you do like her clothes, appearance, work ethic, whatever. But what I can't fathom is this visceral hatred of Kate. Why are people here so emotionally invested in hating her and talking about her in such derogatory terms? And if you hate her so much, why pay her all this attention? It's curious to speculate what void this personal hatred (of someone you do not know) fills. Surely there are much worse people--and more evil targets for hatred--out there. It's not hate, it's disappointment. Disappointment for any number of reasons.